While I’ve only been listening to audiobooks for about a year, When All the World Sleeps might be my first ever impulse buy, as well as the first audiobook I’ve purchased within days of its release. But when I was clearing out our blog’s inbox and happened to open up the email from Riptide, something about the cover caught my eye, then the blurb sounded interesting, but what sold it for me, what made me use my monthly audiobook credit without hesitation was the author/narrator combination. Lisa Henry has scared the bejeezus out of me on more than one occasion. J.A. Rock’s The Subs Club series held me captive, waiting with baited breath for each installment. Both authors have made me laugh, fall in love, enthralled and entertained me. But the clincher… Greg Tremblay was the narrator. I quickly fell in love Tremblay’s vocal talents in Romanus by Mary Calmes and haven’t looked back since. Heck, over the holidays I bought six audiobooks largely because he was the narrator. So to recap, the combination of the authors, the narrator, and an intriguing plot led me to make my first ever impulse buy and I am beyond thrilled that I did. Daniel Whitlock is a convicted murder whose sentence was mitigated due to a medical defense – that he was sleepwalking when he murdered the man who nearly beat him to death. Joe “Bel” Belman is a local cop who is dismayed that Daniel got away with such a ridiculous defense, disturbed by the fact that Daniel was released early, and disgusted that he is attracted to a murderer. Bel is annoyed when he must intercede to prevent Daniel getting beat up, but as an officer of the law he can’t choose who he protects – even if he thinks Daniel deserves the beating. However, when someone tries to kill Daniel, Bel finds himself thrust into Daniel’s life, learning that there is more to the man than what he and the rest of the town have assumed about him and that Daniel’s sleep walking might not be the line of bull he thought it was. The relationship that develops is… intense. Daniel is needy, but not in the way often seen in romances. He needs someone who can control him, someone who has the patience to restrain him while he sleeps so that he doesn’t hurt anyone else. It just so happens that Bel might be capable of fulfilling Daniel’s needs because his own protective streak makes him ideal for the job – protecting the town from Daniel and protecting Daniel from the town, especially when the arsonist seems intent on finishing the job of ridding the world of Daniel Whitlock. When All the World Sleeps was a fascinating story. From what I remember from my neurological psychology class in college, the premise behind the storyline is not impossible and the authors do a wonderful job of crafting a plot around the improbable. Even though I began listening to the audiobook immediately after reading the blurb, with the combination of the authors’ writing skills and Tremblay’s performance, I found myself falling into the trap of the judgmental – accepting what those around Daniel said about him as fact. Tremblay conveys such conviction in Bel’s thoughts and interactions with Daniel, that it was so easy to paint Daniel as a lying, murdering tweaker. Yet with the simple change in the point of view from Bel’s to Daniel’s, Tremblay’s portrayal of Daniel exudes fear, frustration, self-loathing, helplessness, hopelessness, and longing – all with the added difficulty of performing both the awake Daniel and the sleep-walking Daniel. Henry and Rock’s words are superb and Tremblay’s performance is stunning, and combined they made When All the World Sleeps an audiobook I was captivated by and look forward to enjoying again. 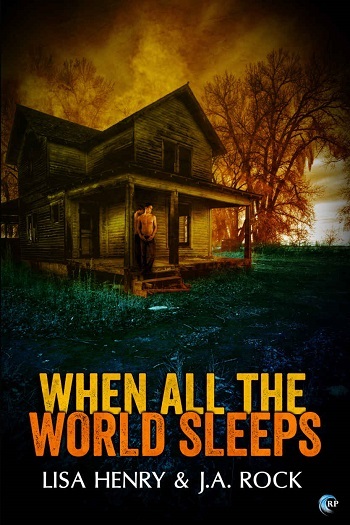 Angela reviewed her personal copy of When All the World Sleeps by Lisa Henry & J.A. Rock, Narrated by Greg Tremblay for this post.